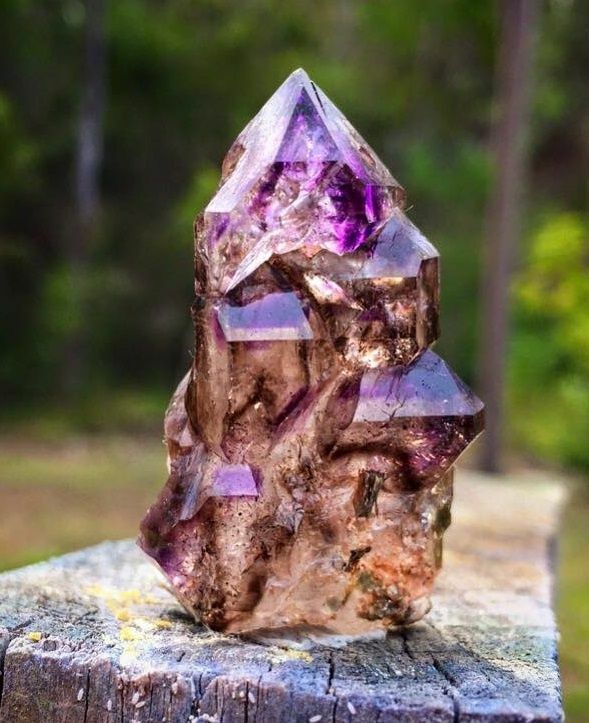 Brandberg Amethyst is a stunning and unique variety of Quartz crystal found only in Namibia, Africa - a mystic blend of Amethyst, Clear and Smoky Quartz together in one exceedingly high- vibrational crystal. Formed where powerful Earth meridians cross, this mineral is imbued with remarkable phantoms, enhydros, and other rare formations and inclusions. It is a potent talisman of healing and perfection with the capacity to restore one back to their etheric blueprint, the energetic state that existed before the soul’s journey began, in order to realign with the Divine Source. Brandberg Amethyst attunes to pure consciousness and is the most versatile and multi-dimensional healing tool on the planet, unparalleled in its beauty, energy and light. Brandberg Amethyst is named for the soaring mass of granite known as “The Brandberg,” Namibia’s highest mountain located in Damaraland in the northwest Namib Desert near the coast. Rising from the desert, this dome-shaped massif can be seen for miles, and viewed from space reveals a perfect circular form. The name Brandberg is Afrikaans, Dutch and German for “Fire Mountain” and comes from the effect of the setting sun on the western slope which sometimes causes a vibrant orange glow. Called “Burning Mountain” by the indigenous Damara people, and “Mountain of the gods” by the Herero, The Brandberg is considered sacred, a spiritual site of great significance to the San (Bushmen) tribes who sheltered there and rendered over 48,000 paintings and engravings within its caves and overhanging rocks. Brandberg Amethyst is carefully mined by hand by local miners from beds near the surface. The surface stones are becoming much harder to find, and the miners are now digging deeper and working harder to unearth more of these magical crystals from further down. Brandberg Quartz forms as clusters of pyramids on a geode base, as tall prismatic crystals, short stubby crystals, drusy aggregates and in massive form. It occurs as colorless crystal or in various shades and mixtures of purple, brown, gray, or yellow, and may be translucent with milky “inner worlds” to completely transparent. Each crystal is unique, often containing exceptional phantoms (ghosted image of a crystal within a crystal), enhydros (air bubbles in water-filled chambers), rainbows, pyramidal “windows,” or with inclusive flecks of Lepidocrocite, Goethite or even Epidote. Very rarely, Brandbergs can be found with solid inclusions trapped in water. Crystal Vaults can verify at least two in existence. The name is sometimes mistakenly referred to as Brandenberg. Smoky Brandberg is an ideal stone for deep Earth healing, with a marvelous energy for restoring the earth grid back to a more perfect state and realigning its chakra and meridian systems. It cleanses and re-attaches one’s cosmic anchor for gaining access to past-life knowledge and progression, and in understanding one’s current situation as “exactly right” for spiritual evolution in this life. 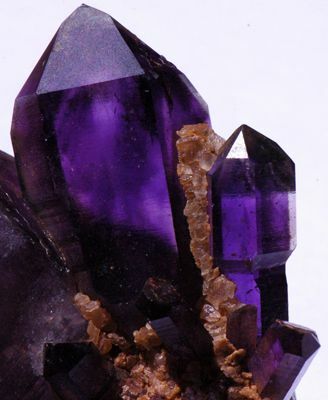 Brandberg crystals with a visible blend of Amethyst and Smoky Quartz, either as phantoms or body color, are the finest tools for removing implants, attachments, spirit possession or mental influences. It is particularly supportive for conscious transformation or transition, especially through death. 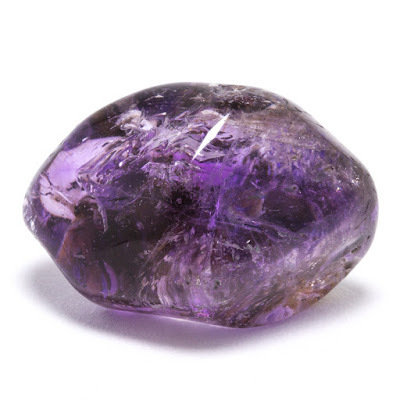 Brandberg Amethyst is a master healer, speeding recovery from illness or injury, providing aid in overcoming harmful addictions, and restoring balance, health and vitality to the system. It is highly beneficial for energetic depletion, bringing clarity and increased brain function, as well as renewed vigor and a sense of peace and joy. Brandberg crystals are also Earth-healers, found where powerful meridians feed the soul energy of the planet. Their clear, radiant energy is a key to planetary healing and the expansion process, often finding their way to spiritually advanced Light workers. They are excellent for blocking geopathic stress and negative environmental energies, eliminating harmful effects of radiation or radioactivity, and are great crystals for clearing houses, buildings or anywhere that feels hostile. 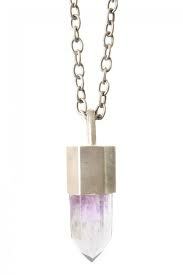 Use Brandberg Amethyst to cut unhealthy ties and to release old soul covenants. Its frequency works quickly to disconnect those who have previously made a mystic marriage or whose relationship is intertwined at the higher spiritual chakras. Brandberg Amethyst is a master healer that can energetically retune core vibrational patterns and align all systems of the body for optimum functioning. It restores vitality and is highly beneficial for recovery from immune deficiencies, severe depletion or illness, chronic fatigue, and in treating disorders of the skeleton, nervous and digestive systems. It is also thought to assist in treating hearing disorders and to alleviate dental pain. This crystal carries the resonance for profound cellular healing and twelve-strand DNA activation, and is believed to encourage new neural pathways for increasing limbic brain function. It may be of assistance in cases of concussion, and is useful in calming a chaotic mind and treating stress disorders. 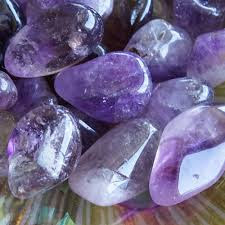 Brandberg Amethyst provides marvelous support for healing the emotional body and bringing it back to center. Its high vibrational energy calms and soothes, enveloping one in a pure, positive light. It emanates infinite compassion and can effect deep soul healing and forgiveness, allowing one to release past or present hurts and traumas, heartbreak, and negative thought forms or influences that no longer serve one’s better good. Brandberg Amethyst brings peace and a sense of harmony to one’s life, encouraging empathy for others, assistance in change and adaptability, and for those who genuinely seek self-improvement, it allows one to look inward for answers and to unearth creativity and potential. Because Amethyst initiates wisdom and greater understanding, it is a comforting crystal for those grieving the loss of a loved one. Its presence communicates that there is no death, only transitioning and changing of forms. It encourages the release of sorrow, and rejoicing in a loved one’s spirit being freed from the confinement of the physical body. Called “the soul stone,” Amethyst assists in understanding and connecting to the eternal existence of the soul and initiates one’s own deep soul experiences. It is an ideal crystal to hold or meditate upon during the death experience, of another or oneself, allowing the release of the temporal physical body with more ease, assuredness and peace. It is a perfect stone to gift to those with terminal illnesses or to use in preparation for a conscious death experience. Brandberg Amethyst resonates with one’s core spiritual identity, elevating consciousness to the highest level and allowing for a pure connection with the original Source: All That Is. 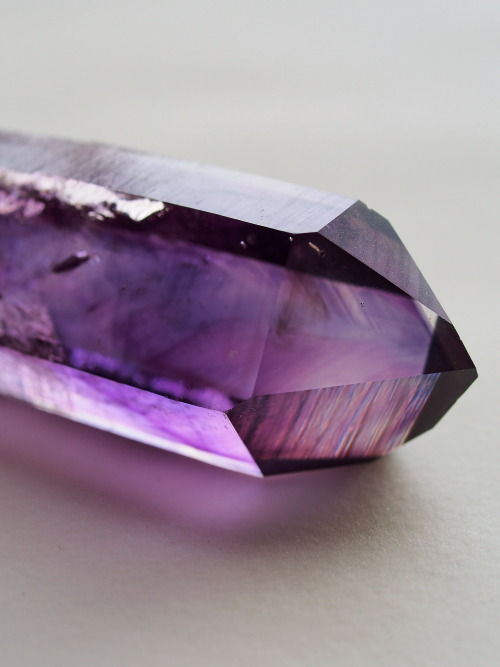 By taking one back to the most perfect energetic state possible, the etheric blueprint from which the soul began, Brandberg Amethyst can realign the systems of the body and retune core vibrational patterns to restore balance to all levels of being. It assists in travel to the between-lives state to ascertain one’s soul-plan for the current lifetime, and identifies conscious choices made along the way that may have caused one to deviate from that plan. It helps one return to their true path, healing effects of trauma from previous lives, and releasing karmic imprints, connections and soul imperatives that no longer serve. As a gatekeeper, this crystal protects against psychic attack, alien invasion and negative energy, and assists during soul-retrieval or child-parts retrieval, facilitating purification and integration of those parts into the present self. Amethyst is one of the best crystals for meditation. Its color stimulates the highest vibration of the Third Eye, and placing an Amethyst directly over this area ushers in a serene meditative state that stills conscious thought and guides the mind toward deeper understanding. Amethyst energy encourages the mind to be humble and surrender to that which is greater than itself in order to gain some understanding of how the powers of the universe can direct and guide one’s life. 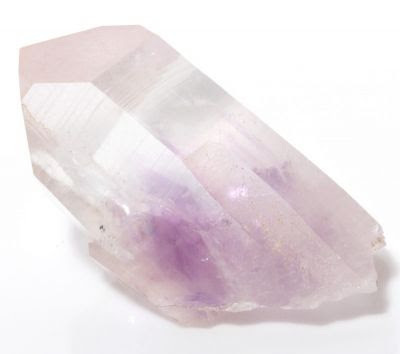 With the additional energies of clear and Smoky Quartz, Brandberg Amethyst is particularly conducive to brainwave combinations that enhance meditation, past life regression and healing. It attunes to pure consciousness while keeping one securely grounded, and provides a safe, rapid link between dimensions. The phantoms and inclusions within the crystal can act as a vibrational ladder for consciously traversing the higher realms and retaining insights gathered there. It is an excellent tool for meeting and communicating with one’s spirit guide and angelic helpers, and for discerning what lessons are planned for this life cycle.